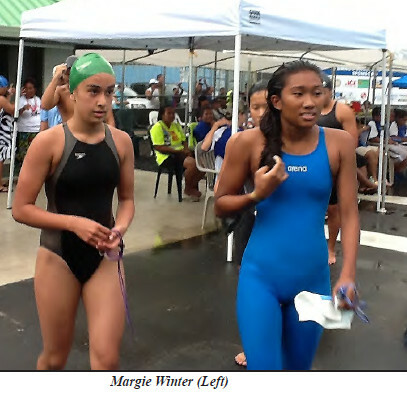 Chuuk, FSM—When Margie Winter, swam in the 2014 Micro Games representing Chuuk State she was only 12 years old. She and her brother were the Chuuk Swimming Team, and we were all very proud of them. Margie continues to swim. On March 18-20, 2016, the YMCA New York State Championships Meet was held at the State University of New York at Buffalo, Alumni Natatorium in Buffalo, NY. Thirty-seven (37) YMCA’s with a total of 1210 athletes took part in 3009 events. One of those swimmers was Margie Winter whose mother, Marian WIshim, is from Unanu. Her Grandmother, Morris Mark is from Polowat and her Grandfather, Max Hockey is from Unanu. Her father is Dr. Stephen Winter. Margie Winter competed as a 13 year old in the 13-14 year age group. She entered the 50 Free, 100 Free and 100 fly. The results for this 13 year old girl are impressive. Since 2014 her times have continued to improve to where she is now one of the FSMs premier female swimmers. Congratulations to Margie Winter and the people of Unanu, Polowat and other islands. She has made the FSM very proud.